Eventmasters are delighted to provide official VIP Goodwood Revival hospitality packages for the opening day of this iconic motor sport event – Friday 13th September 2019. The Revival is the world’s most popular historic motor race meeting and the only event of its kind to be staged entirely in the nostalgic time capsule of the 1940s, 50s and 60s that relives the glory days of Goodwood Motor Circuit. It is the biggest and best historic motor racing party of the year. 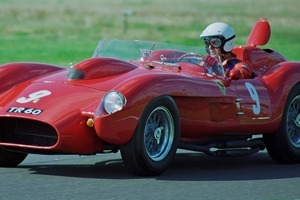 It offers visitors the opportunity to leave the ‘modern world’ behind within the themed hospitality facilities and join motor sport luminaries including Sir Stirling Moss, Richard Attwood, John Surtees and Derek Bell in an unabashed celebration of flat-out wheel-to-wheel racing around a classic racetrack. The Art Deco-styled pavilions benefit from a covered decked balcony and access to a lawn that sits between them and the track. They are also air-conditioned and have plasma screens so you and your guests can watch the racing in this prestigious environment in total comfort.